A PDF or Portable Document Format reader is a file format to display documents containing texts and images. It first came into light at the beginning of the 90s, and since then there is no looking back, As on date, PDF reader software for Windows is extensively used by the people from every field across the globe. The best thing about this software is, it works fine on all kinds of the system especially for jpg to pdf conversion, be it a Mac or a Windows system. With the advancement of technology, the PDF has evolved much more than just to open documents. A complete PDF reader offers various options like merging to different files, file conversion, image extraction, splitting text into individual pages, and much more. So, picking the right tool for your task is must, and it can only be done when you know about all the available options. 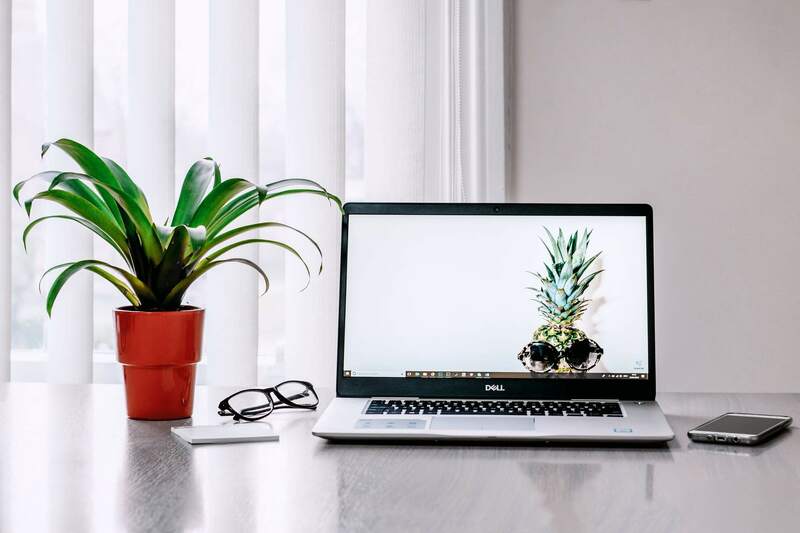 So, today I will be taking you through the list of best PDF reader software for Windows that you can use on your Windows PC. After installation of every PDF reader, you will come across a dialogue box that will ask you to make it your default reader. I recommend you to try any of the below-mentioned software before making up your mind. For your convenience, I have put down a graph below, which shows the ability of various PDF readers to compress the files compared to their competitors. Here is the list of 8 best PDF reader software for Windows PCs, which include the likes of Foxit Reader, PDF-XChange Editor, Adobe Acrobat Reader DC, Nuance Reader, and more. It’s better; if you go through them personally. The first PDF reader listed here is the Foxit reader, which is well-known PDF reader software for Windows. It can support a number of operations like commenting on documents, notifies about the new updates, let the people discuss the topic in the document itself, secures the crucial documents, and much more. Foxit Reader comes packed with ConnectedPDF tech, which is leading edge technology that powers cloud-based services for PDF files. Its services include Security, Document Management, and Collaboration. It also allows creating PDF from standard file formats. And to enhance productivity and flexibility, it links knowledge workers together and let them share valuable information. Foxit reader takes the lead from other similar software by providing multiple security options, which can secure the information by protecting the documents themselves. The software is designed to comply with the extension of every size of organizations. It provides a lot of features which are missing in many other PDF readers. The software goes beyond regular viewing and annotation. 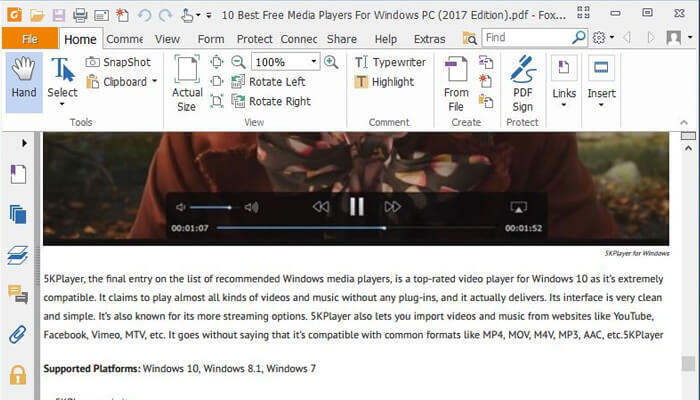 This PDF reader software for Windows offers over 300 file formats, and you can create a document from any of the Windows application. To make it more simple, you just need to drag-and-drop files to create a document. The story doesn’t end here. There are other customizable tools which you can be used to set colors, font embedding, output quality, and orientation. With its intuitive user interface, you can easily view files, add texts and collaborate. And in the files with digital signatures and comments, the review pane will help you to know what to review first. Furthermore, you can comment, provide feedback, underline, highlight, and edit the document thoroughly. Another notable feature of this software is that all the documents created through this software are compatible with almost all other readers, which won’t pose an issue when you share your document with other people. It also offers an option of securing the document with password-protect. Adobe Acrobat Reader DC is another PDF reader software for Windows that can come in handy. It comes packed with almost all the tools to edit, convert, and sign PDFs. You can virtually scan your device into a scanning tool with its text recognition feature. It can capture text from documents, notes, receipts, business cards, and convert it into a PDF document. 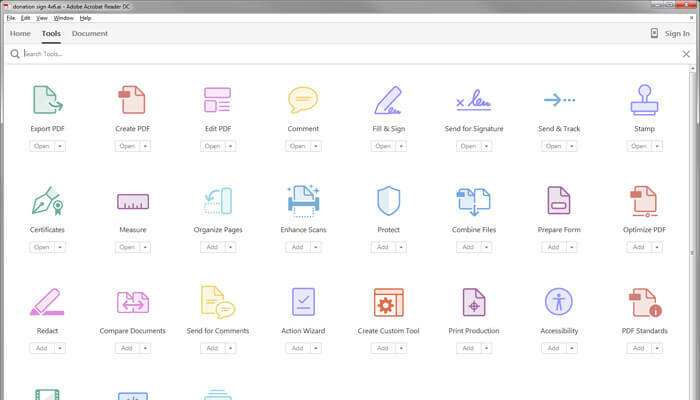 After creating a PDF document, you can further edit, share, protect, sign, and search. With its e-signing feature, you can sign and get around with over one billion devices. So, it gives the freedom to sign documents with a finger on a touch-enabled device legally. You can even send, track and store signed documents. It is an excellent PDF reader software for Windows that lets you easily view and print the documents on any Windows operating system. It also enables you to modify documents created by other software by adding document outlines, modify annotations, insert rubber stamp, and more. The best thing about this software is that is fast and easy to handle, which ultimately uncomplicates the viewing of PDF documents. For more options, you can switch to Expert PDF Editor that offers much more options and tools. The software can work smoothly on Windows 2000/XP/2003/Vista or later. 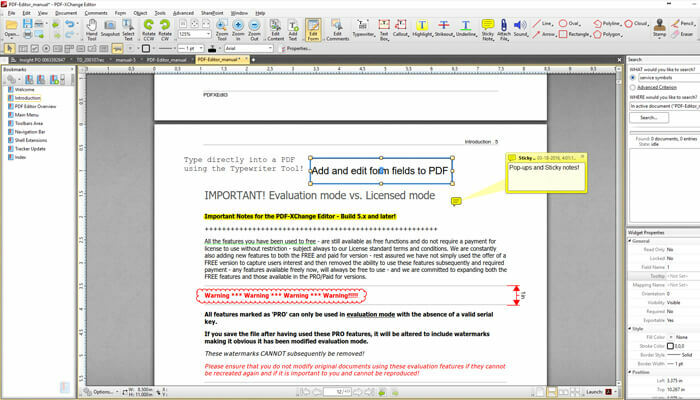 PDF-XChange Editor is an absolute PDF reader software for Windows that offers fully-customizable options to make your document. 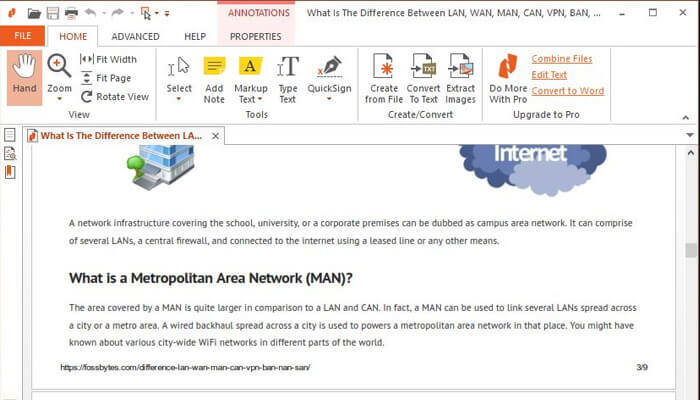 You can create, edit, view, sign, and annotate your documents. The software provides more than thirty tools to create the PDF document. These tools help is making the document an absolute piece of craftsmanship. The best part of PDF-XChange Editor is, it can convert Microsoft Office documents into PDF, which many other viewer software misses. Creating a new document is just a cake walk for it, as you can do it by scanning, images, text files, documents, etc. It’s user-friendly interface and functionality fits all classes of people, from the beginner to a pro, everyone can use it with ease. Javelin PDF reader is known to provide most of the primary functions required for viewing PDF files and editing them. This PDF reader software for Windows comes packed with the Drumlin Publisher software that can encrypt any document. It helps you to protect against content copying and further distribution. The software offers a wide array of options like the addition of internal and external hyperlinks, page display formats, contents/navigation trees, annotation, plus document text searching, and markup. Apart from Windows, the software can also work on Mac systems. If you are looking for a PDF reader software for Windows that can take care of all the tasks, the Nuance Reader should be your pick. It offers much more than a regular PDF reader. You can convert PDF files to Word, Excel, and RTF via a hosted web service. You can also use annotation tools to highlight, cross-out, and underline text for more effective collaboration. 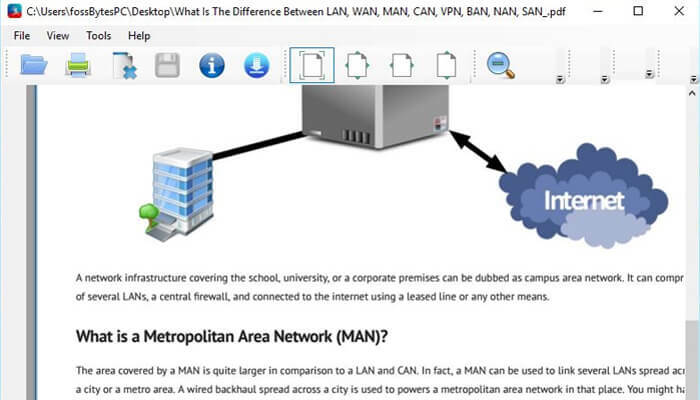 If compared to other PDF reader software for Windows, the Nuance Reader takes up less disk space and works with virtually any document. The software can also fill out and save PDF forms. With Nuance Reader, you can easily upload, convert, and start using information previously trapped in a document. The last PDF reader in my rundown comes from Ice-cream apps, which is not a dedicated software for the creation of PDF document in Windows, but it can well help you in managing your documents. It’s a convenient media file software that keeps the documents in order. When you create a document with Icecream PDF Reader on Windows, none of the images, text, graphics and other elements will get distorted, which is quite impressive. 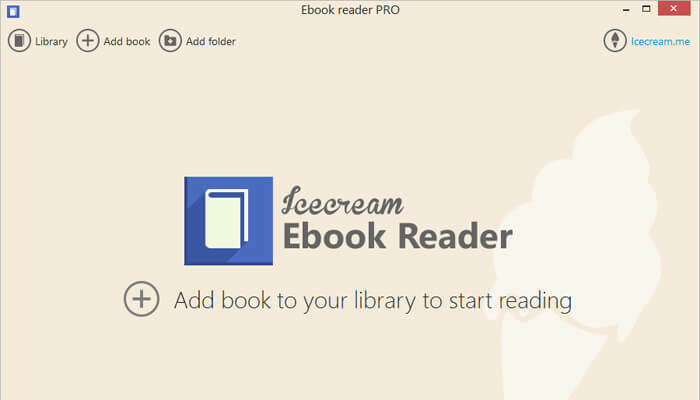 The Icecream apps have its another product for the readers, Ebook Reader, which has its own set of features. Its Ebook software supports various formats like EPUB, FB2, MOBI, CBR, CBZ, and TXT. 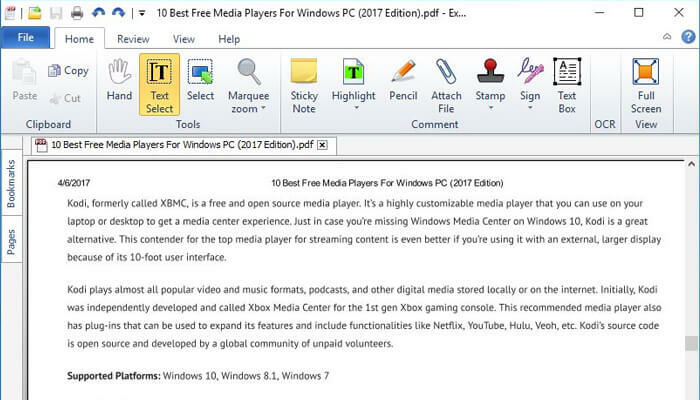 If you are already using PDF reader software for Windows other than mentioned in the list, try to give a chance to any one of these, and I can promise, it won't disappoint you. Who knows, you might want to make the new PDF reader as your new default software. 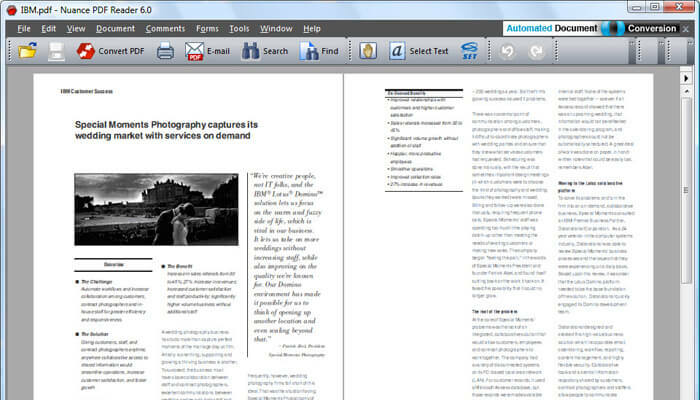 Though with today's feature-filled Windows browsers, the need for a third-party PDF reader is on the fall. But please note; still, some tasks can’t be done without the help of such software. Activities like digital signature, annotations, and form filling can only be done with the help of advanced PDF reader. The individual needs and require also matters, but I am sure, you will be able to find a suitable one among so many PDF readers for Windows.